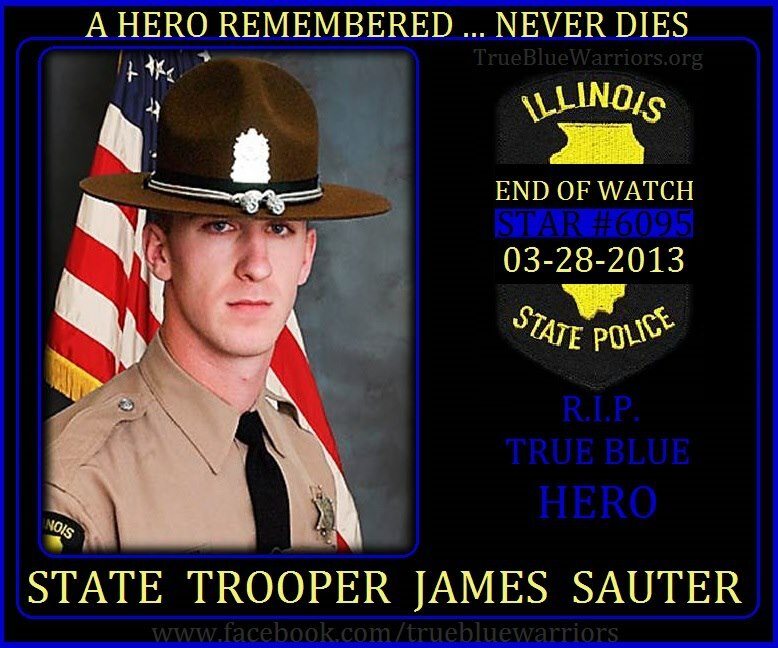 Trooper James Sauter, 28, was killed in a fiery wreck when hit by a semi. (details below). Born with a soul that has courage to wear the badge, Trooper Sauter had been Saving, Serving, and Protecting the People of Illinois since June 29, 2008. Even early on, during the academy, this True Blue Warrior proved he was meant to be a Police Officer. While going through training, Cadet Sauter had come across a motorcycle accident. With no hesitation nor reservation, he jumped out to help a female victim in the roadway. He performed life saving emergency care and was awarded a Life Saving Medal for his actions. After graduation, Trooper Sauter transitioned smoothly and quickly became a favorite among his peers. With a smile that could light up a room and a personality to compliment it, Brother James was a pleasure to work along side of. He was a fearless Warrior who was very proactive in his duties and all the badge represented. Taking pride in his ‘armor’, inside and out, Trooper Sauter, assigned to District 15, greeted each new day as an adventure. Though very serious about his work, Brother James always kept his compassion at the ready, knowing that at any given moment, a citizen made need his soft touch and comforting words. Through his years of experience, Trooper Sauter also knew that not all always is at it appears and he approached each and every incident with an open mind. He treated everyone with an unbiased attitude, got to the truths and took appropriate actions. Brother James, who was an experienced licensed pilot, recently spent several months with the Air Operations Unit but decided ‘boots on the ground’ was where his heart was, so he went back to patrol. Trooper Sauter was very active in DUI enforcement. For him, it was not about locking people up, it was about keeping innocent motorists safe. Brother James was a very benevolent young man who truly cared about the citizens he served. He also knew that whether in uniform or not, he represented all of the 900,000+ LEOs out there and paid great mind to making sure he represented us all in the finest of fashion. This young Warrior simply wanted to make a difference in his small corner of the world … and a difference he did make … Living As Only A Hero Could. May we learn from his ways and carry a piece of our Brother with us as we continue to create our own legacies. At approximately 2315hours, while on his ‘Highway Beat’, Trooper Sauter had just wrapped up with a motorist and was pulled off on the left shoulder of the Interstate when a semi (moving truck) slammed into his cruiser, causing a massive explosion. Trooper Sauter was killed on impact. James leaves behind his beloved bride Elizabeth, dad Donald and mom Eileen. Our heartfelt thoughts and prayers go out to the entire Sauter family, the Men and Women of the Illinois SP, the Chicago PD, the Illinois Tollway, and to all whom have had the pleasure and the privilege of knowing and working along side this True Blue Hero. Special thoughts are with all those working the reconstruction investigation of this horrific collision and to our Fire Fighter family who took great pains to carefully extricate our Brother from the crushed remains of the cruiser. (This process took more than an hour). Our Brother, as you now patrol the highways of Heaven may you continue your vigilant watch over us all as we carry on … In Our Brother’s Honor. We thank you for your service and for your sacrifice. We thank you for your life.Job Well Done Sir. Rest In Peace State Trooper James Sauter – Star #6095 … We have the watch from here. SALUTE! Services: Visitation Monday from 3 p.m. to 9 p.m. at Moraine Valley Church, 6300 W. 127th St. in Palos Heights – Funeral is Tuesday at 11 a.m. at the same church.